This song book of Capitol Recording Artists Tex Williams and his Western Caravan was released by Gene Autry's music publishing company Golden West Melodies in 1947. The cover has a large photo of Tex Williams and a smaller photo of his Western Caravan. 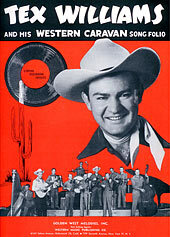 In addition to the sheet music, this song book has a brief autobiography of Tex Williams and several pages of "doublespread pictures" in black and white of Tex Williams and his Western Caravan.